Flacco was born in Audubon, New Jersey, the son of Karen (née Madden) and Steve Flacco. Flacco played football, baseball, and basketball at Audubon High School and was the starting quarterback for the Green Wave. The Flacco family is originally from Haddon Township, New Jersey. Regarded as a three-star recruit by Rivals.com, Flacco was listed as No. 39 among quarterback prospects in the class of 2003. In 2003, as part of the Pittsburgh Panthers football team, Flacco was redshirted as a freshman for a team that went 8–5. In 2004, he was the backup quarterback finding limited playing time behind starter Tyler Palko. He only saw action in three games against Ohio University, University of Nebraska, and the University of South Florida. He finished the season with one completion for 11 yards. 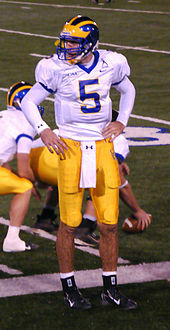 Flacco saw his first full-time action during the 2006 season. Playing for Fightin' Blue Hens Flacco threw for 2,783 yards, and 18 touchdowns with 10 interceptions. Delaware struggled to a 5–6 record, and failed to qualify for the FCS playoffs. In the 2007 season, Flacco led his team to an 8–3 regular season record while compiling 4,263 yards, 23 touchdowns and 5 interceptions. Arguably his best game came against Navy where he threw for 434 yards and four touchdowns. Flacco showed another solid performance in the first-ever meeting against the Delaware State Hornets in the first round of the playoffs. Behind Omar Cuff's record-setting day, Flacco threw efficiently for 189 yards and a touchdown, leading the Blue Hens to an easy 44–7 victory. Flacco continued Delaware's playoff run by upsetting the Northern Iowa Panthers 39–27 in the FCS quarterfinals and upsetting the Southern Illinois Salukis 20–17 the next weekend in the semifinals. Flacco threw two touchdowns to win against both the Panthers and Salukis, but went on to lose in the championship game to the Appalachian State Mountaineers 49–21. Flacco set 20 school records during his career at Delaware. In early September 2009, a 20- by 30-foot poster of Flacco was added to the facade of Delaware Stadium. At Delaware, Flacco was pessimistic about his chances to play in the NFL, and after his junior year asked his coach for permission to play baseball. The coach predicted that he would be selected in the NFL Draft, surprising Flacco. With a solid showing at the Senior Bowl and NFL Combine, Flacco solidified himself as a top five quarterback in the 2008 NFL Draft. Flacco won the long distance throw competition in ESPN's State Farm College Football All-Star Challenge with a 74-yard throw, beating out Matt Ryan, Colt Brennan, Chad Henne, and John David Booty, later winning the Taco Bell Quarterback Scramble with a time of 15.72 seconds. Members of the Baltimore Ravens' front office, having attended Flacco's workout at the Senior Bowl, were impressed by his ability to throw in rainy and windy conditions. Flacco again impressed the Ravens' personnel in the poor weather conditions of his workout at Delaware, despite their low expectations given Delaware's small-school pedigree—Flacco performed the workout on an uncut, unlined field with his own footballs. Ravens assistant general manager Eric DeCosta later stated the workouts left him confident Flacco could succeed in the late-season conditions in Pittsburgh and Cleveland. Flacco was drafted by the Ravens with the 18th overall pick in the 2008 NFL Draft after the team traded out of the eight overall selection to the 26th, then up again. The selection made Flacco the highest drafted player ever from the University of Delaware. He was also the first Division I-FCS (formerly I-AA) quarterback selected in the first round of the draft since Steve McNair went third overall to the Houston Oilers in the 1995 NFL Draft. Draft commentators initially criticized the pick as a "reach", feeling Flacco would likely have still been available in the middle of the second round. DeCosta, however, stated waiting was too much of a gamble and that choosing Flacco in the first round was "an easy decision to make." On July 16, 2008, he signed a five-year contract with a maximum value of around $30 million, and $8.75 million guaranteed. 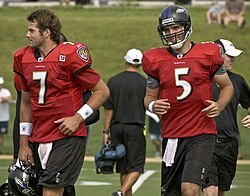 Due to a season-ending injury to incumbent starter Kyle Boller and an illness to former Heisman Trophy winner Troy Smith, Flacco became the starting quarterback in the 2008 season opener against the Cincinnati Bengals. He completed 15 of 29 passes for 129 yards, his longest pass being a 15-yard play to Derrick Mason. He threw no touchdowns and no interceptions in his debut, but he had a 38-yard rushing touchdown, which was the longest rushing touchdown by a quarterback in Ravens' franchise history. Flacco's touchdown put the Ravens up by 17–3; the team eventually won the game 17–10. 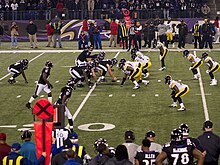 Flacco (crouching) lines up against the Pittsburgh Steelers in 2008. In his first season, Flacco was named AFC Offensive Player of the Week in Week 9, NFL Rookie of the week, the NFLPA Rookie of the week, and NFL Rookie of the Month for November. Flacco finished his rookie season 257/428 for 2,971 yards with a total of 16 touchdowns (14 passing, 2 rushing), and 14 turnovers (12 interceptions and 2 lost fumbles). In the wild card round of the 2008–09 NFL playoffs, Flacco became only the third rookie quarterback in NFL history to win his first post-season start, and the first to do it on the road, when his Ravens defeated the Miami Dolphins, 27–9. Flacco completed 9-of-23 attempted passes, accumulating 135 yards without throwing a touchdown or interception. He also scored the victory-sealing rushing touchdown on a quarterback draw in the 4th quarter. Shaun King, Ben Roethlisberger, Russell Wilson, and Mark Sanchez are the only other rookie quarterbacks to ever win their debut playoff game. He then won his second game versus the Tennessee Titans. Flacco led the Ravens to a 13–10 win in the divisional playoff round. Flacco made tight-window throws to Todd Heap and Mark Clayton on the go ahead scoring drive in the 4th quarter to set up a game-winning field goal from Matt Stover. On the day, Flacco was 11-of-22 for 148 yards and a touchdown, without turning the ball over for the second straight game. He is the first rookie quarterback to win two playoff games. In the 2009 AFC Championship Game versus the Pittsburgh Steelers, the Ravens lost 23–14, with Flacco throwing for 141 yards, being sacked a three times and throwing three picks, one being the game clincher to Troy Polamalu, who returned the pass for a touchdown. Flacco was named the Diet Pepsi NFL Rookie of the Year in January 2009. In the season opening game in Baltimore against the Kansas City Chiefs, Joe Flacco led the Ravens to their first win of the season. He threw for 307 yards and three touchdowns, both career highs, along with 18 yards rushing. He also threw one interception and had a quarterback rating of 95.8. During this game, the Ravens broke the franchise record for most offensive yards in a game with a total of 501. In Week 15 against the Chicago Bears, Flacco broke his personal record for most touchdowns thrown in a game with four, while throwing for 234 passing yards and completing 72 percent of his passes, earning him a career-high passer rating of 135.6. The Ravens would go on to win the game 31–7. With 3,613 yards and 21 touchdowns, Flacco became the first Ravens quarterback since Vinny Testaverde to throw for more than 3,000 yards and more than 20 touchdowns in a single season. He also tied his interception number from his rookie season of 12. An injury limited Flacco's performance Wild Card Weekend against the New England Patriots. The Ravens routed the Patriots 33–14 despite Flacco throwing 4-of-10 for just 34 yards with one interception. 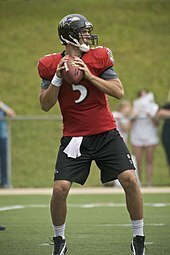 Flacco drops back to pass during practice. In the season opener, Flacco and the Ravens opened New Meadowlands Stadium against the New York Jets. Flacco threw for 248 yards while completing 52.6% of his passes, throwing one interception and losing a fumble. In a defensive contest, the Ravens came away with the 10–9 win over their former defensive coordinator Rex Ryan. In Week 2 at the Cincinnati Bengals, Flacco had arguably his worst NFL start of his young career, throwing for 154 yards while completing just 43.6% of his passes and throwing a career-high four interceptions, while throwing one touchdown and accumulating a passer rating of 23.8. Coming off of the worst start of his career, Flacco and the Ravens had their home opener against the Cleveland Browns. Flacco bounced back from his Week 2 loss to the Bengals and had his best game of the young season, throwing for 262-yards and completing 71% of his passes. He then hooked up with prized offseason acquisition wide receiver Anquan Boldin for three touchdowns, while throwing no interceptions and accumulating a passer rating of 128.7. The Ravens won the contest 24–17. On December 26, 2010, with a win against the Cleveland Browns, Flacco became one of only four NFL quarterbacks to lead his team to the playoffs in all three of his first three seasons. During this game, Flacco reached 10,000 career passing yards. Ending the season, Flacco set season highs in passing yards (3,622), passing touchdowns (25), passer rating (93.6), and a season low in interceptions (10), yet set a career-high with four lost fumbles. In defeating the Kansas City Chiefs (30–7) in the wildcard round of the 2010–11 NFL playoffs, Flacco completed 25 of 34 passes for 265 yards and two touchdowns, with no interceptions, for a post-season-high passer rating of 115.4. With the win, Flacco became the first quarterback in NFL history to start and win a playoff game in each of his first three seasons, and tied Len Dawson, Roger Staubach, Jake Delhomme, and Mark Sanchez for most career post-season road wins by a quarterback. In the divisional round, Flacco and the Ravens would once again head to Pittsburgh to play their arch-rival Steelers. The difference this time would be the season was on the line. The Ravens got out to an early 21–7 lead after a 12-yard rush by running back Ray Rice, a fumble recovery run back for a touchdown by defensive end Cory Redding, and a four-yard touchdown pass from Flacco to tight end Todd Heap. But in the third quarter, which the Ravens had been dominant in all of the regular season, Baltimore fell apart. The Ravens turned the ball over three times in their own territory with an uncharacteristic fumble by Rice, an interception by Flacco, and a fumbled snap by Center Matt Birk (Flacco was credited with the lost fumble), and with those the Steelers took a 31–24 lead. But even after all of the Ravens miscues and errors, the Ravens still had a shot to win it at the end when Flacco threw a dart to Houshmandzadeh, but it was dropped. Flacco finished the game 16-of-30 for 125 yards, one touchdown, and one interception. He was ranked 90th by his fellow players on the NFL Top 100 Players of 2011. Flacco had his best game of the season in Week 3 against the Pittsburgh Steelers. He went 27-of-48 with a season-high 389 yards through the air and three touchdowns, all in the first quarter and to rookie wideout Torrey Smith (who actually finished the game with a five catch, 152-yard breakout performance). Flacco had a 103.6 rating, as well as 27 yards rushing and a lost fumble. The Ravens scored a season-high 37 points in the 30-point blowout victory, and also gained a franchise record 553 offensive yards. Flacco had three more 300-yard games during the regular season: against the Houston Texans, Arizona Cardinals and Steelers in a Sunday Night Football matchup. He won all three of these games, sweeping Pittsburgh for the first time in his career, but also lost fumbles in each one. Despite losing to the San Diego Chargers in Week 15, the Ravens clinched the playoffs for the fourth straight year that week. The Ravens clinched their division, along with the number 2 seed in the AFC, in a Week 17 win over the rival Cincinnati Bengals. Flacco threw for 130 yards and a touchdown. Flacco finished the season starting all 16 games. He had 312 completions on 542 attempts (57.6%). He threw for 3,610 yards, 20 touchdowns, 12 interceptions, and had one rushing score. He averaged 225.6 yards per game, was sacked 31 times over the course of the season and set a new career high with six lost fumbles. He finished the year with an 80.9 QB rating. Flacco continued his playoff dominance that year. In the Divisional playoff game against the Houston Texans, he threw for 176 yards and two touchdowns, with no turnovers. In the AFC Championship Game, Flacco completed 22 out of his 36 attempts while throwing for two touchdowns and one interception along with 306 yards passing. These stats were enough to outplay New England Patriots quarterback Tom Brady, who threw for 67 fewer yards, 2 fewer touchdowns, and 1 more interception than Flacco. Despite Flacco's performance, the Patriots won to advance to the Super Bowl. Joe Flacco warms up before a home game versus the New England Patriots in 2012. On the NFL Network's Top 100 Players of 2012 list, Flacco was ranked 74th by his fellow players. Despite Flacco's success—the Ravens were in the playoffs each of his first four seasons—few saw him as among the NFL's best quarterbacks. Before January 2015, he had never been selected for the Pro Bowl. In April 2012 Flacco was, as The New York Times later stated, "almost universally mocked" when he stated that he was the best quarterback in the NFL, superior to Brady, Peyton Manning, or Aaron Rodgers. "I don’t think I’d be very successful at my job if I didn’t feel that way", Flacco said. In July, he turned down the Raven's offer of a new contract, reportedly for $16 million a year, telling his agent that he believed he could improve and earn more. 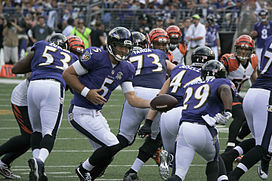 In the opening week, Flacco passed for 299 yards and two touchdowns in a 44–13 victory over the Cincinnati Bengals to earn his second AFC Offensive Player of the Week honor. By Week 11, the Ravens had amassed a 9–2 record. Flacco played poorly however once again in a Week 12 rematch with the Steelers, completing only 16 of 34 passes for 188 yards with one touchdown and an interception. The game saw the Ravens squander a ten-point lead and lose 20–23, despite their division rival starting backup Charlie Batch at quarterback. The following week against the Washington Redskins, Flacco went 16-of-21 with three touchdowns but again amassed less than 200 passing yards in the season's first back-to-back losses. With the offense remaining inconsistent and the team missing opportunities to win their division with each loss, offensive coordinator Cam Cameron was unexpectedly fired and replaced by quarterbacks coach – and former Indianapolis Colts head coach – Jim Caldwell. The change at coordinator was followed by a lopsided loss to the Denver Broncos, leading to widespread criticism of Flacco in the media. Flacco and the Ravens responded with a decisive, 33–14 win over the defending Super Bowl-champion New York Giants in which Flacco threw for 309 yards and two touchdowns, with another rushing. Despite the victory over New York, much of the local and national media wrote the team off as Super Bowl contenders, with ESPN writing that the team had "backed into the playoffs with a disastrous December." On January 6, 2013, in the Wild Card Playoffs round against the Indianapolis Colts, Flacco finished the game 12 of 23 for 282 yards, two touchdowns, and a career postseason high 125.6 passer rating. The 24–9 win at home set up a Divisional round rematch with the Broncos, who entered the game as nine-point favorites after their regular season win over the Ravens, which included a 98-yard interception touchdown return by Broncos' cornerback Chris Harris that marked the lowest point of Flacco's season. Continuing his postseason success, Flacco played one of the best games in his career, throwing for 331 yards and 3 touchdowns. In the fourth quarter, the Ravens were down 35–28 and had one last chance to tie the game. After an incomplete pass and a 7-yard scramble, on 3rd down and 3, Flacco heaved a 70-yard touchdown pass to Jacoby Jones, sending the game into overtime. The pass has been called the "Mile High Miracle", and "one of the greatest plays in NFL history" and drew comparisons to Roger Staubach's "Hail Mary", Terry Bradshaw's "Immaculate Reception", and Joe Montana's "The Catch". The Ravens would go on to win the game in double overtime 38–35 after an interception by Corey Graham from Peyton Manning and a 47-yard field goal from Justin Tucker, sending the Ravens to face the New England Patriots in the AFC Championship for a second straight year. On January 20, 2013, Flacco and the Ravens avenged the previous year's AFC Championship Game loss to the New England Patriots with a 28–13 win, securing their spot in the 2013 Super Bowl. Flacco threw for 240 yards and three touchdowns, notching his third straight game with a passer rating over 100. With this win, Flacco became the second NFL quarterback to defeat both Peyton Manning (with the Broncos) and Tom Brady in the same postseason since both became starting quarterbacks in 2001 (the first to do so was Mark Sanchez in 2010). Flacco attempts a pass to Ray Rice in Super Bowl XLVII, which Baltimore won 34–31 over the San Francisco 49ers. In a 34–31 win over the favored San Francisco 49ers in Super Bowl XLVII, played on February 3, 2013, Flacco completed 22 of 33 passes for 287 yards and another three touchdowns, tying him for first place on the list of most consecutive playoff games with at least three touchdown passes (3 games). With a record fourth playoff game with a 100+ passer rating in a single postseason, Flacco was named the game's Most Valuable Player. For winning the award, he was given a then-brand-new red Chevrolet Corvette. Flacco finished the postseason having completed 73-of-126 (57.9 percent) passes for 1,140 yards with 11 touchdowns and zero interceptions, tying Montana and Kurt Warner for the most touchdowns in a single postseason and additionally tying Montana for the most touchdowns without an interception in a single postseason. Flacco's 117.2 passer rating tied him for third place all-time with Steve Young in a Super Bowl-winning postseason. These accomplishments gave Flacco what The New York Times stated "might be the best start to a player's free agency in the history of professional sports", as his contract expired after the season. He was ranked 19th by his fellow players on the NFL Top 100 Players of 2013. On March 4, 2013, Flacco became the highest-paid quarterback in NFL history when he signed a six-year contract worth $120.6 million. However, within months, he was surpassed by the Packers' Aaron Rodgers and the Falcons' Matt Ryan. Flacco's 2013 season was statistically the worst of his career. For the first time as an NFL quarterback, Flacco threw more interceptions than he threw touchdowns. His 22 interceptions in the season were 10 more than he had thrown in any other season. His 19 touchdowns were also his lowest since his rookie year. His passer rating was a career low 73.1, approximately 7 points lower than Flacco's previous worst season passer rating. He was also sacked more times (48) than he was in any other season in his career. Despite all this, he also set a high in passing yards, with 3,912. The Ravens finished 8–8 for the season and Flacco missed the playoffs for the first time in his career. He was ranked 58th by his fellow players on the NFL Top 100 Players of 2014. In their 2014 season home opener, the Ravens played against the division rival Cincinnati Bengals. The game saw the Ravens trailing practically the entire time; however, their one lead of the game came off of an 80-yard touchdown pass from Flacco to wide receiver Steve Smith Sr.. As of the 2016 season, it was the longest throw of Flacco's career. However, the Ravens would go on to lose the game 23–16, after Bengals' quarterback Andy Dalton connected with receiver A. J. Green for an even more stupendous 77-yard touchdown that would ultimately be the game winner. It would be the first time since 2005 that the Ravens lost their home opener. Flacco finished the game completing 35 of 62 passes and throwing for a season-high 345 passing yards along with a touchdown and an interception, with a passer rating of 71.0. Flacco had his best game of the season in Week 6, and one of the best games of his career. He completed 21 of 28 passes for 306 yards and a career-high five touchdown passes to four different receivers (Smith Sr., Torrey Smith, Kamar Aiken and Michael Campanaro) with no interceptions. He once again wasn't sacked and had a season-high passer rating of 149.7. Flacco became the fastest quarterback to throw five touchdown passes, as it only took him 16 minutes and 3 seconds. The Ravens blew out the Tampa Bay Buccaneers 48–17. He earned AFC Offensive Player of the Week honors for the third time in his career. In Week 16, the Ravens took on the Houston Texans with a chance to clinch the playoffs. Flacco played his worst game of the season, and arguably the worst of his career. He ended the first half with only 27 passing yards and two interceptions, as the Ravens trailed 16–0 going into halftime. The Ravens would rally in the second half, as Flacco threw two touchdown passes to Torrey Smith, but the Ravens never held a lead in the entire game and ended up losing 25–13. Flacco finished completing 21 of 50 passes for 195 yards, two touchdowns and three interceptions with a season-low passer rating of 41.7. He was also sacked twice. In Week 17, the Ravens took on the Cleveland Browns in Baltimore. They had the chance to clinch the final playoff seed, but they needed a win and for the Kansas City Chiefs to beat or tie the San Diego Chargers. Trailing 10–6 in the fourth quarter, Flacco stepped up big time. He heaved a deep pass to Torrey Smith, who caught the ball at the Browns' 16 yard line. On the next play of the game, Flacco connected with Smith again, this time for a touchdown, which put the Ravens up 13–10 for good with 7:33 left in the game. With 3:44 left in the game, Flacco threw another touchdown pass to Kamar Aiken, sealing a 20–10 win. Kansas City would beat San Diego 19–7, giving Baltimore the final AFC playoff spot. Flacco finished the game with 22 of 36 completed passes, 312 passing yards, 2 touchdowns and no interceptions with a passer rating of 107.6. Flacco was also sacked one time, which caused one of his two fumbles in the game (he did not lose either). 2014 saw Flacco have the best regular season of his career. He set highs in passing yards (3,986), passing touchdowns (27), times sacked (19), fumbles (5) and fumbles lost (0). He also attempted and completed the second most single-season passes in his career (344 completions out of 554 attempts) and tied his mark for second lowest amount of interceptions thrown in a regular season (12). From Weeks 2 through 4, Flacco was not sacked at all. In 5 of Flacco's last 6 games of the season, his passer rating was 99 or higher, with the one exception being the 25–13 loss to Houston. He led Baltimore to a 10–6 record. In the Wild Card round of the playoffs, the Ravens played the AFC North-winning Pittsburgh Steelers at Heinz Field. Flacco completed 18 of 29 passes for 259 yards, two touchdowns and no interceptions with a passer rating of 114.0, as the Ravens beat the Steelers 30–17. He was sacked once, after getting tripped up by his offensive lineman on the Ravens' first offensive play of the game. This became the first time that the Ravens beat the Steelers in the postseason. Flacco also continued his streak of winning a game in his team's first round of the playoffs. His biggest accomplishment, however, may have been that he became the first quarterback in NFL history to start and win a playoff game in six of their first seven seasons. In the Divisional round of the playoffs, the Ravens traveled to Foxborough to take on the number-one seeded New England Patriots, where they lost to the eventual Super Bowl champions in a 31–35 shootout, despite two back-to-back 14-point leads. Flacco still performed well, going 28/45 with 292 passing yards, a career-postseason-high 4 touchdown passes, 2 interceptions and a 92.1 passer rating. He was once again not sacked either. For his efforts during the 2014 season, Flacco was invited to the 2015 Pro Bowl as an alternate but turned down the opportunity to play because his wife, Dana, was due to give birth to the couple's third child the same month. On the NFL Top 100 Players of 2015, Flacco was ranked number 97, the lowest that he has ever been ranked, on the NFL's Top 100 Players list. He fell 39 spots from the previous year, where he was ranked number 58. The Ravens began their 2015 season in a road game against the Denver Broncos, the place where Flacco had his breakout playoff performance nearly three years earlier. Leading the game, 13–9, with less than a minute left in the third quarter, Flacco threw a pass down the middle of the field, aiming for Steve Smith Sr., but missed the pass terribly, as it was intercepted by Broncos cornerback Aqib Talib and returned 51 yards for a touchdown. It was Flacco's first pick-six since the 2013 season finale. With less than a minute left in the game, the Ravens had the ball at the Denver 16-yard line and were trailing, 19–13. Flacco threw a pass into the end zone, intended for double-covered tight end Crockett Gillmore, which was intercepted by safety, and former Raven, Darian Stewart, officially ending the game for Baltimore. In Week 2, against the Oakland Raiders, Flacco bounced back by going 32-of-45 with 384 yards and two touchdown passes to Crockett Gillmore, with a 102.5 passer rating. However, while trying to rally the Ravens back at the end of the game, he was picked off by cornerback Neiko Thorpe with less than 30 seconds left, giving the Raiders a 37–33 upset win. It was the first time in his NFL career that Flacco had started out a season with a 0–2 record. On the final drive of the Ravens' Week 11 game versus the St. Louis Rams, Flacco suffered a torn ACL and MCL, ending his 2015 season. He stayed in the game to complete the drive and put Baltimore into a position to kick the game-winning field goal, giving the Ravens a 16–13 win at home. The Ravens had a 3–7 record with Flacco at starting quarterback. Flacco finished the season with 266 completed passes out of 413 attempts, 2,791 yards, 14 touchdowns, 12 interceptions, an 83.1 passer rating, three rushing touchdowns and five fumbles, losing two. On March 2, 2016, Flacco agreed to a three-year extension to remain with the team. After their Week 3 victory against the Jacksonville Jaguars, Flacco and the Ravens had accrued a 3–0 record, their best record after three games since 2009, but the Ravens would struggle down the stretch, finishing with an 8–8 record and missing the playoffs for the second straight season, the first consecutive playoff misses for the franchise since 2004–2005. Flacco posted a career-high and franchise record 4,317 passing yards, the first time he reached at least 4,000 yards, but only threw 20 touchdowns and 15 interceptions, the second highest of his career. Flacco posted a 6.4 average per attempt, tying his career worst. Flacco also completed a career-high and franchise best 436 completions, and a career-high and franchise best 672 attempts. The 672 pass attempts currently rank fifth most in a single season in league history. On July 26, 2017, it was revealed that Flacco was diagnosed with a back injury, ruling him out for 3–6 weeks of training camp. During Thursday Night Football against the Miami Dolphins in Week 8, Flacco suffered a concussion after a hit from Kiko Alonso. Flacco left the game, and was relieved by Ryan Mallett for the rest. 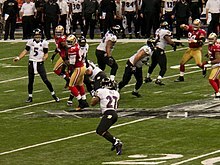 The Ravens nevertheless won 40–0. The Ravens finished the season with a 9–7 record and just missed the playoffs after losing 31–27 to the Cincinnati Bengals in Week 17, allowing the Buffalo Bills to qualify for the postseason. Flacco finished the season starting all 16 games, throwing for 3,141 yards and 18 touchdowns with 13 interceptions. On September 9, 2018, Flacco threw for three touchdowns and had a passer rating of 121.7 in the season-opening blowout against the Buffalo Bills 47–3. The next week, on Thursday Night Football, he recorded 376 yards and two touchdowns along with two interceptions against the Cincinnati Bengals, losing his seventh game in Cincinnati. He fumbled the ball in the fourth quarter, ending the chance for a comeback. After suffering a hip injury during a Week 9 loss to the Pittsburgh Steelers, Flacco was replaced by rookie Lamar Jackson as the Ravens' starting quarterback. Jackson performed well going 6–1 at the helm, and Flacco served in a backup role for the first time in his NFL career after he was cleared to play. Overall, Flacco finished with 2,465 passing yards, 12 touchdowns, and six interceptions. During the Wild Card Round at home against the Los Angeles Chargers, which the Ravens trailing as much as 23–3 due to early struggles by Jackson, many fans chanted for Flacco to be brought on which never happened, while late in the fourth quarter, Jackson managed to make the game close in a 23–17 final loss. On February 13, 2019, the Ravens agreed to trade Flacco to the Denver Broncos in exchange for their fourth-round pick in the 2019 NFL Draft. The deal became official on March 13, 2019. Flacco signed a three-year contract with Reebok as a rookie in 2008. In 2009–2010, Flacco was a spokesperson for Pizza Hut, which sold a product called "Flacco's Favorites". Flacco has also endorsed Nike and 1st Mariner Bank, as well as Haribo since January 2013. Also in 2013, Flacco signed an endorsement deal with McDonald's to promote their new menu item, the Mighty Wings. Flacco has also teamed up with opendorse to promote a Zynga mobile application called "NFL Showdown: Football Manager" as well as a line of women's apparel for Spirit Football Jersey. Joe Flacco married his wife Dana in 2011. Together they have five children; their first child Stephen Flacco was born in June 2012, Daniel Flacco was born September 15, 2013, about an hour before the start of the Ravens' home opener. Francis Flacco was born in January 2015 and  Thomas Flacco was born in April 2018. The Flaccos' only daughter, Evelyn Flacco, was born in September 2016. He is the oldest out of the five boys in his family. His brothers are named Mike, John, Brian, and Tom. His brother Mike was selected in the 31st round of the 2009 Major League Baseball draft by the Baltimore Orioles, and was the starting first baseman for the Frederick Keys, who won the 2011 Carolina League championship. He hit for a .250 average, with 5 HRs and 22 RBIs in 50 games with the Keys. The Orioles traded him to the Boston Red Sox on March 15, 2013, and rather than accepting the assignment, Flacco decided to retire from baseball. He then enrolled at the University of New Haven to play football as a tight end, and declared for the 2014 NFL Draft. [needs update] Another brother, John, was a walk-on receiver with the Stanford Cardinal football and played against the Army Black Knights football team at the 2013 Stanford vs. Army football game. 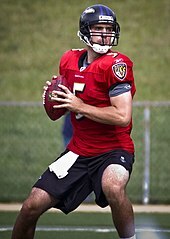 Joe's youngest brother, Tom Flacco, enrolled in 2015 at Western Michigan University, where he played quarterback for two seasons before transferring to Rutgers in 2017 and then Towson in 2018. In a survey by Fanatics in January 2017, Flacco was elected as the most attractive player in the NFL. ^ a b McIntyre, Brian (March 1, 2013). "Ravens, Joe Flacco agree to terms on contract extension". Yahoo! Sports. Retrieved March 1, 2013. ^ Mink, Ryan (January 6, 2015). "Why Joe Flacco is so good in the playoffs". BaltimoreRavens.com. Archived from the original on May 11, 2018. ^ Rosenthal, Gregg (July 3, 2012). "Ron Jaworksi: Joe Flacco has strongest arm in NFL". National Football League. Retrieved January 20, 2013. ^ a b c Byrne, Kerry (February 4, 2013). "Flacco, Eli have turned Super Bowl predictors upside down". Sports Illustrated. Retrieved February 10, 2013. ^ Gormley, Chuck (March 2009). "Ordinary Joe". South Jersey Magazine. SouthJersey.com. 5 (12). Retrieved February 4, 2013. ^ "Super Bowl XLVII: Joe Flacco's Jersey roots keep him humble before biggest game of his life". The Star-Ledger. Retrieved March 28, 2018. ^ "2003 Pitt Panthers Schedule and Results". College Football at Sports-Reference.com. Retrieved December 30, 2017. ^ "2004 Pitt Panthers Stats". Retrieved March 28, 2018. ^ "Pitt at South Florida Box Score, December 4, 2004". College Football at Sports-Reference.com. Retrieved December 30, 2017. ^ "Joe Flacco 2004 Game Log". College Football at Sports-Reference.com. Retrieved December 30, 2017. ^ a b "Joe Flacco College & Pro Football Statistics". Totalfootballstats.com. Retrieved January 13, 2013. ^ "Football – Schedule – Delaware". Delaware Blue Hens Athletics. Retrieved December 30, 2017. ^ "Delaware Fightin Blue Hens vs. Navy Midshipmen – Box Score – October 27, 2007". ESPN. October 27, 2007. Retrieved January 13, 2013. ^ a b "2007 University of Delaware Football FINAL Statistics". University of Delaware. Archived from the original on February 2, 2012. Retrieved January 13, 2013. ^ a b "Delaware Quarterback Joe Flacco Selected 18th Overall by Baltimore in First Round of National Football League Draft". University of Delaware. April 26, 2008. Archived from the original on January 5, 2009. Retrieved March 15, 2010. ^ a b c Battista, Judy (February 5, 2013). "A Top-Tier Quarterback Set to Be Paid Like One". The New York Times. p. B9. Retrieved February 4, 2013. ^ "Flacco continues to improve; North return men are impressive". ESPN Insider. January 24, 2008. Retrieved December 27, 2010. ^ "State Farm College Football All-Star Challenge". jlsports.net. Retrieved February 1, 2013. ^ a b c Judge, Clarke. "EJ Manuel a bad-weather QB? It sealed the deal for the Buffalo Bills". CBSSports.com. Retrieved May 5, 2013. ^ Walker, James (July 17, 2008). "Agent: Flacco agrees to five-year deal with Ravens". ESPN. Retrieved December 30, 2017. ^ Hensley, Jamison (September 8, 2008). "Flacco off and running in debut". The Baltimore Sun. Retrieved December 27, 2010. ^ "Cincinnati Bengals at Baltimore Ravens – September 7th, 2008". Pro-Football-Reference.com. Retrieved December 30, 2017. ^ "2008 NFL Week 9 Leaders & Scores". Pro-Football-Reference.com. Retrieved March 28, 2018. ^ "Joe Flacco 2008 Game Log". Pro-Football-Reference.com. Retrieved December 30, 2017. ^ "Wild Card – Baltimore Ravens at Miami Dolphins – January 4th, 2009". Pro-Football-Reference.com. Retrieved December 30, 2017. ^ Hensley, Jamison (January 4, 2009). "Joe Cool – Eerie Calm Drives Rookie From 3rd String to First Postseason". The Baltimore Sun. Retrieved February 4, 2013. ^ Bishop, Greg (January 19, 2008). "Steelers' Defense Rattles Normally Steady Flacco". The New York Times. Retrieved February 4, 2013. ^ Duffy, Mike. "Joe Flacco Named 2008 Diet Pepsi Rookie of the Year". Baltimore Ravens. Archived from the original on January 18, 2018. Retrieved December 30, 2017. ^ "Kansas City Chiefs at Baltimore Ravens – September 13th, 2009". Retrieved December 30, 2017. ^ "Chicago Bears at Baltimore Ravens – December 20th, 2009". Pro-Football-Reference.com. Retrieved December 30, 2017. ^ "Baltimore Ravens Single-Season Passing Leaders". Pro-Football-Reference.com. Retrieved December 30, 2017. ^ "Wild Card – Baltimore Ravens at New England Patriots – January 10th, 2010". Pro-Football-Reference.com. Retrieved December 30, 2017. ^ "Baltimore Ravens at New York Jets – September 13th, 2010". Pro-Football-Reference.com. Retrieved December 30, 2017. ^ "Baltimore Ravens at Cincinnati Bengals – September 19th, 2010". Pro-Football-Reference.com. Retrieved December 30, 2017. ^ "Cleveland Browns at Baltimore Ravens – September 26th, 2010". Pro-Football-Reference.com. Retrieved December 30, 2017. ^ "Wild Card – Baltimore Ravens at Kansas City Chiefs – January 9th, 2011". Pro-Football-Reference.com. Retrieved December 30, 2017. ^ Banks, Don (January 13, 2011). "Inside the NFL". Sports Illustrated. Retrieved January 13, 2011. ^ "Divisional Round – Baltimore Ravens at Pittsburgh Steelers – January 15th, 2011". Pro-Football-Reference.com. Retrieved December 30, 2017. ^ "Top 100: Joe Flacco". Baltimore Ravens. Archived from the original on March 28, 2018. Retrieved March 28, 2018. 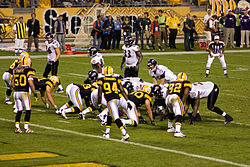 ^ "Pittsburgh Steelers at Baltimore Ravens – September 11th, 2011". Pro-Football-Reference.com. Retrieved December 30, 2017. ^ "Baltimore Ravens at Cincinnati Bengals – January 1st, 2012". Pro-Football-Reference.com. Retrieved December 30, 2017. ^ "2011 Baltimore Ravens Statistics & Players". Pro-Football-Reference.com. Retrieved December 30, 2017. ^ "Joe Flacco 2011 Game Log". Pro-Football-Reference.com. Retrieved December 30, 2017. ^ "Joe Flacco". National Football League. Retrieved August 15, 2015. ^ "Divisional Round – Houston Texans at Baltimore Ravens – January 15th, 2012". Pro-Football-Reference.com. Retrieved December 30, 2017. ^ "Baltimore Ravens vs. New England Patriots – Box Score – January 22, 2012". ESPN. Retrieved August 15, 2015. ^ "'Top 100 Players of 2012': Joe Flacco". National Football League. Retrieved March 28, 2018. ^ Klemko, Robert (February 4, 2013). "Partying with Super Bowl MVP Joe Flacco means parents, pop". USA Today. Retrieved February 7, 2013. ^ a b c Borden, Sam (February 4, 2013). "Flacco's Precision Typical of Elite Quarterbacks". The New York Times. pp. D1. Retrieved February 4, 2013. ^ "Cincinnati Bengals at Baltimore Ravens – September 10th, 2012". Pro-Football-Reference.com. Retrieved March 28, 2018. ^ "2012 NFL Week 1 Leaders & Scores". Pro-Football-Reference.com. Retrieved March 28, 2018. ^ "Pittsburgh Steelers at Baltimore Ravens – December 2nd, 2012". Pro-Football-Reference.com. Retrieved December 30, 2017. ^ "Baltimore Ravens at Washington Redskins – December 9th, 2012". Pro-Football-Reference.com. Retrieved December 30, 2017. ^ Schmuck, Peter. "Ravens lost four of last five regular season games, but never lost faith". The Baltimore Sun. Retrieved February 8, 2013. ^ "New York Giants at Baltimore Ravens – December 23rd, 2012". Pro-Football-Reference.com. Retrieved December 30, 2017. ^ Judge, Clark. "Another win seems improbable for free-falling Ravens". CBS Sports. Retrieved February 8, 2013. ^ Hensley, Jamison. "Ravens proving to be team of destiny". AFC North Blog. ESPN. Retrieved February 8, 2013. ^ "Wild Card – Indianapolis Colts at Baltimore Ravens – January 6th, 2013". Pro-Football-Reference.com. Retrieved December 30, 2017. ^ Hensley, Jamison. "Turning point of Joe Flacco's season". AFC North Blog. ESPN. Retrieved February 8, 2013. ^ Shwab, Frank. "Joe Flacco validates himself with a Super Bowl MVP award". Yahoo! Sports. Retrieved February 5, 2013. ^ a b Pells, Eddie (January 12, 2013). "Ravens Beat Broncos 38–35 In Double OT: Flacco, Jones, Tucker Lead Baltimore To AFC Title Game". HuffPost. Retrieved February 5, 2013. ^ Greenberg, Chris (January 12, 2013). "Jacoby Jones Touchdown: Joe Flacco Throws 70-Yard TD, Sending Ravens To Overtime (VIDEO)". HuffPost. Retrieved February 5, 2013. ^ "AFC Championship – Baltimore Ravens at New England Patriots – January 20th, 2013". Pro-Football-Reference.com. Retrieved December 30, 2017. ^ a b Klemko, Robert (February 3, 2013). "Ravens' Flacco fulfills promise with Super Bowl victory". USA Today. Retrieved February 5, 2013. ^ a b c Barnwell, Bill. "Super Bowl Redux". Grantland.com. Retrieved February 5, 2013. ^ "'Top 100 Players of 2013': Joe Flacco". National Football League. Retrieved March 28, 2018. ^ "FIND OUT WHICH QB JUST BECAME THE HIGHEST PAID PLAYER IN NFL HISTORY". TheBlaze. Retrieved April 26, 2013. ^ Hensley, Jamison. "Flacco is now NFL's third-highest paid QB". AFC North Blog. ESPN. Retrieved July 29, 2013. ^ "Joe Flacco: Career Stats at NFL.com". National Football League. Retrieved January 25, 2015. ^ "2013 Baltimore Ravens Statistics & Players". Pro-Football-Reference.com. Retrieved December 30, 2017. ^ "NFLN: 'Top 100 Players of 2014': Joe Flacco". Baltimore Ravens. Archived from the original on March 28, 2018. Retrieved March 28, 2018. ^ "Cincinnati Bengals at Baltimore Ravens – September 7th, 2014". Pro-Football-Reference.com. Retrieved December 30, 2017. ^ "Joe Flacco: Game Logs at NFL.com". National Football League. Retrieved August 15, 2015. ^ "Baltimore Ravens at Tampa Bay Buccaneers – October 12th, 2014". Pro-Football-Reference.com. Retrieved December 30, 2017. ^ "2014 NFL Week 6 Leaders & Scores". Pro-Football-Reference.com. Retrieved March 28, 2018. ^ "Baltimore Ravens at Houston Texans – December 21st, 2014". Pro-Football-Reference.com. Retrieved December 30, 2017. ^ "Cleveland Browns at Baltimore Ravens – December 28th, 2014". Pro-Football-Reference.com. Retrieved December 30, 2017. ^ "Joe Flacco 2014 Game Log". Pro-Football-Reference.com. Retrieved December 30, 2017. ^ "Wild Card – Baltimore Ravens at Pittsburgh Steelers – January 3rd, 2015". Pro-Football-Reference.com. Retrieved December 30, 2017. ^ "Divisional Round – Baltimore Ravens at New England Patriots – January 10th, 2015". Pro-Football-Reference.com. Retrieved December 30, 2017. ^ Zrebiec, Jeff (January 20, 2015). "Joe Flacco declines chance to play in Sunday's Pro Bowl". The Baltimore Sun. Retrieved July 4, 2015. ^ "'Top 100 Players of 2015': No. 97 Joe Flacco". National Football League. Retrieved December 30, 2017. ^ "Baltimore Ravens at Denver Broncos – September 13th, 2015". Pro-Football-Reference.com. Retrieved December 30, 2017. ^ "Baltimore Ravens at Oakland Raiders – September 20th, 2015". Pro-Football-Reference.com. Retrieved December 30, 2017. ^ "Joe Flacco is out for season after tearing ACL in win". National Football League. Retrieved November 22, 2015. ^ "Joe Flacco 2015 Game Log". Pro-Football-Reference.com. Retrieved December 30, 2017. ^ Hensley, Jamison (March 2, 2016). "Joe Flacco gets 3-year extension with record $40M signing bonus". ESPN. Retrieved March 2, 2016. ^ "Joe Flacco 2016 Game Log". Pro-Football-Reference.com. Retrieved December 30, 2017. ^ "2016 Baltimore Ravens Statistics & Players". Pro-Football-Reference.com. Retrieved December 30, 2017. ^ Shook, Nick. "Joe Flacco (back) preparing to sit out 3–6 weeks". National Football League. Retrieved July 27, 2017. ^ Wesseling, Chris. "Joe Flacco suffers concussion on hit from Kiko Alonso". National Football League. Retrieved October 27, 2017. ^ "Joe Flacco 2017 Game Log". Pro-Football-Reference.com. Retrieved March 12, 2019. ^ Hensley, Jamison (September 9, 2018). "TD party: Joe Flacco, Ravens 'showing the world' their new targets". ESPN. ^ Hensley, Jamison (September 14, 2018). "Joe Flacco still can't shake his Cincinnati struggles". ESPN. ^ "Ravens' Harbaugh on quarterback Joe Flacco hip injury". baltimoresun.com. Retrieved January 22, 2019. ^ "Ravens to stay with Jackson over healthy Flacco". ESPN.com. December 12, 2018. Retrieved January 22, 2019. ^ "Ravens Lamar Jackson Starting At QB, Joe Flacco 'Disappointed'". CBS Baltimore. December 12, 2018. Retrieved January 6, 2019. ^ "Harbaugh expecting Flacco's practices to be "ramped up"". NBC Sports Washington. December 5, 2018. Retrieved January 22, 2019. ^ "In classy exit, Joe Flacco provides smooth handoff to Lamar Jackson". ESPN.com. January 8, 2019. Retrieved January 22, 2019. ^ Teope, Herbie (February 13, 2019). "Broncos agree to trade for Ravens QB Joe Flacco". NFL.com. ^ DiLalla, Aric (March 13, 2019). "Broncos trade for quarterback Joe Flacco". DenverBroncos.com. ^ "Flacco on Ravens Victory". January 10, 2009. Retrieved March 4, 2012 – via YouTube. ^ "Most regular season wins by QB in first 7 seasons". pro-football-reference.com. Retrieved October 6, 2016. ^ Banks, Don (January 6, 2013). "Wild Card Snap Judgments". Sports Illustrated. Retrieved January 6, 2013. ^ Chase, Chris. "Joe Flacco threw five TDs faster than any QB in modern NFL history". USA Today. Retrieved October 13, 2014. ^ Salfino, Michael. "Joe Flacco Is the King of the NFL Playoffs". The Wall Street Journal. Retrieved March 9, 2015. ^ a b c d e f g h i j k l m n o p q r s t u "Baltimore Ravens Team Encyclopedia". Pro-Football-Reference.com. Retrieved January 29, 2013. ^ "Joe Flacco Breaks Ravens Franchise Record With 21 Straight Completions". ^ "Nike, Reebok Get Busy Signing NFL Draft rookies to Endorsement Deals". Blackvoices.com. April 29, 2008. Archived from the original on May 1, 2008. Retrieved April 29, 2008. ^ "Joe Flacco – Pizza Hut of Maryland". Pizzahutpizza.com. 2009. Archived from the original on December 3, 2009. Retrieved January 22, 2012. ^ a b Rovell, Darren (January 29, 2013). "Baltimore Ravens' Joe Flacco signs gummy bear endorsement deal". ESPN. Retrieved March 11, 2013. ^ "Joe Flacco's New McDonald's Ad Viewed As Golden Opportunity". CBS Baltimore. September 18, 2013. Retrieved October 7, 2013. ^ Heitner, Darren. "Opendorse Raises $1.75 Million With Plans To Make Athlete Endorsements Smarter". Forbes. Retrieved August 15, 2015. ^ "Meet Dana Flacco, Wife of Super Bowl MVP Joe Flacco". Bleacher Report. February 4, 2013. Retrieved January 6, 2019. ^ Flacco, Joe. "Joe Flacco on Twitter: "On behalf of the Flacco family we're proud to announce the arrival of 8lb Stephen Flacco. Dana, baby & Joe are all doing well -Team Flacco"". Twitter. Retrieved January 6, 2019. ^ Boren, Cindy (February 4, 2013). "Super Bowl 2013: Joe Flacco expects a payday and a baby". The Washington Post. Retrieved February 4, 2013. ^ Meoli, Jon (January 21, 2015). "Joe Flacco, wife Dana, welcome third child Tuesday night". The Baltimore Sun. Retrieved January 21, 2015. ^ "Joe Flacco And Wife Welcome Their 5th Child". ^ "The Caw: Joe Flacco's Fourth Baby, And First Daughter, Has Arrived". Archived from the original on January 17, 2018. ^ "Marc Narducci: Last Flacci stepping in at Eastern". Philadelphia Daily News. Retrieved January 5, 2017. 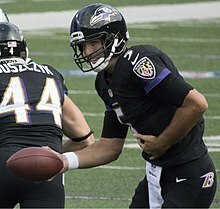 ^ "Scout.com: Flacco Succeeding in Frederick". Scout.com. Retrieved July 23, 2011. ^ Chisholm, Henry (July 19, 2013). "NEW HAVEN FOOTBALL: Mike Flacco, Joe's brother, is newest Chargers tight end". New Haven Register. Archived from the original on July 19, 2013. Retrieved July 19, 2013. ^ Hanzus, Dan (January 7, 2014). "Report: Joe Flacco's brother declares for NFL draft". National Football League. Retrieved January 10, 2014. ^ "Player Bio: John Flacco". Stanford University. Retrieved July 31, 2013. ^ Lombardi, David (September 16, 2013). "Lombardi's Look Back: Army, Flacco Fever". Scout.com. Archived from the original on September 20, 2013. Retrieved September 20, 2013. ^ "Flacco is early enrollee at WMU". MLive.com. Retrieved January 10, 2015. ^ "Joe Flacco's brother transferring from Rutgers, too". CollegeFootballTalk. June 7, 2018. Retrieved June 8, 2018. ^ "The Most Attractive NFL Teams". wearefanatics.com. Retrieved February 10, 2017. ^ "The Caw: Joe Flacco Is The NFL's Most Attractive Player". Archived from the original on January 19, 2018. Retrieved February 10, 2017. ^ "Survey: Ravens QB Joe Flacco Voted Most Attractive In NFL". Retrieved February 10, 2017. ^ "Flacco named most attractive NFL player". Ravens Wire. February 9, 2017. Retrieved February 10, 2017. Wikimedia Commons has media related to Joe Flacco.